Down in the sewer lair, April begs Master Splinter to let her go with the Turtles to scout a new Kraang facility. Splinter tells her that her training remains incomplete and she must be patient. He also warns his sons to be patient, as it is a scouting mission and NOT a combat mission. The Turtles assure their sensei that they will only partake in surveillance. 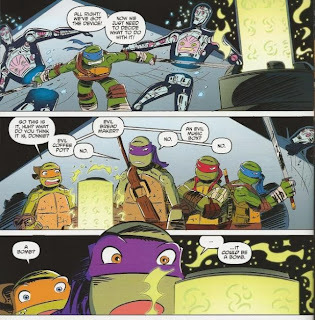 At the Kraang facility, the Turtles leap into action, attacking the Kraangdroids who are guarding and studying a strange glowing tube. They trash the Kraang and steal the tube, figuring it must be a bomb or something. As they load the tube into the Shellraiser and make their getaway, they fail to notice a Kraang probe ship in stealth mode, hovering over the street and watching them intently. The Kraang piloting the ship are pleased, as the substance in the tube will surely destroy the Turtles. Inside the Shellraiser, Donnie is trying to study the contents of the tube when Leo warns his brothers not to touch it until they get home. Impertinent as always, Raph gently pokes the tube. The thing pops open and out bursts an ever-growing mass of slug-like cybernetic tentacles. 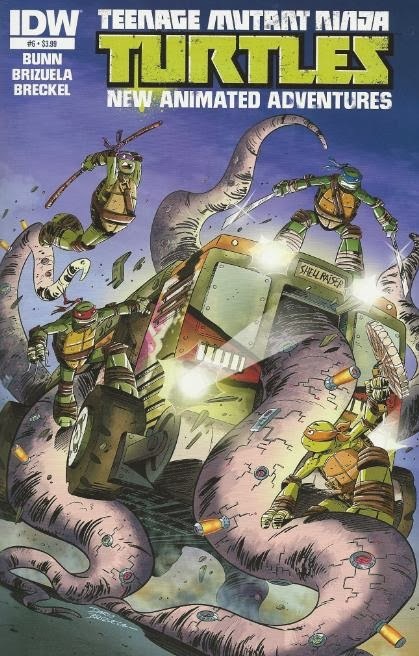 The tentacles quickly fill the Shellraiser, leaving Leo, Don and Mikey to escape through the roof hatch while Raph escapes in the Stealth Bike. The creature seizes control of the Shellraiser and all its weapons. It destroys the Stealth Bike and begins chasing after the Turtles. The Turtles manage to lose it, but figure it will do serious damage to New York if they don’t’ find a way to stop it. Remembering Splinter’s lesson on patience, Donnie suggests they annoy the thing into getting anxious so that it’ll leave the Shellraiser and make itself vulnerable. On his skateboard, Mikey teases the creature and leads the Shellraiser on a chase down a blind alley. Using a set of climbing claws, he scales the alley wall where the creature can’t reach him, then proceeds to tease it until it exits the Shellraiser and comes slithering up the wall after him. The Turtles find their hands full with the slug-monster on the roof of the building, not sure how to get rid of the thing. Leo finally notices the Kraang stealth ship and figures the slug-monster is like a naked snail looking for a shell. Using their grappling hooks, they latch onto the stealth ship and lead the slug-monster to it. As the slug-monster invades the ship (much to the Kraang’s dismay), the Turtles leap to safety. The ship and the monster then go flying out of control and crash into the river. Back at the lair, the Turtles recount their tale to Master Splinter. Splinter asks to know what they learned from their experience. Donnie says that it inspired him to add grappling hooks to the Shellraiser so it can climb walls. Mikey begins making several annoying suggestions for new features, leaving Donnie to impatiently attack him with his notebook. *This story is continued from TMNT New Animated Adventures #5. 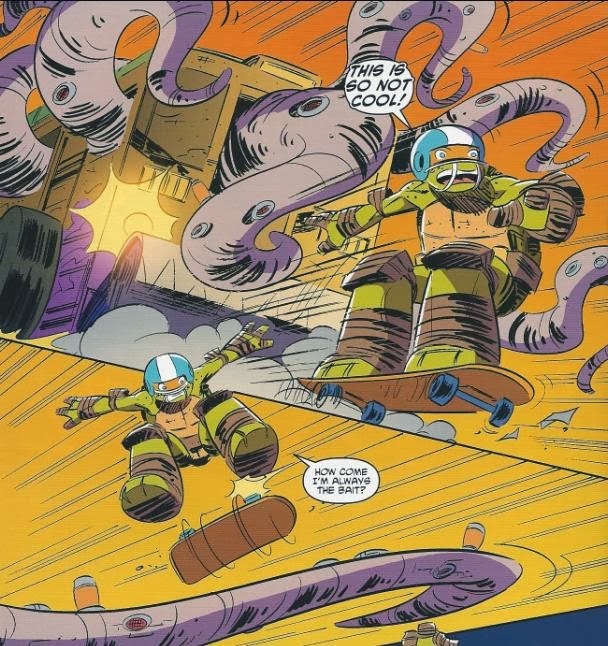 The story continues in TMNT New Animated Adventures #7. *This issue was originally published with 2 variant covers: Regular Cover by Brizuela and Cover RI by Felipe Smith. I was looking forward to this issue when I first read the creative team, as I really dug the first volume of the Flash Thomspon/Venom series. Then I found out that the issues I read were by Rick Remender, not Cullen Bunn. Finding out I had the wrong writer in mind didn’t exactly curb my enthusiasm, but it did leave my expectations at a blank slate, because I had no experience with any of Bunn’s previous work. The story is the usual done-in-one that’s made up the New Animated Adventures series so far and Bunn does a good job of sticking to the formula. 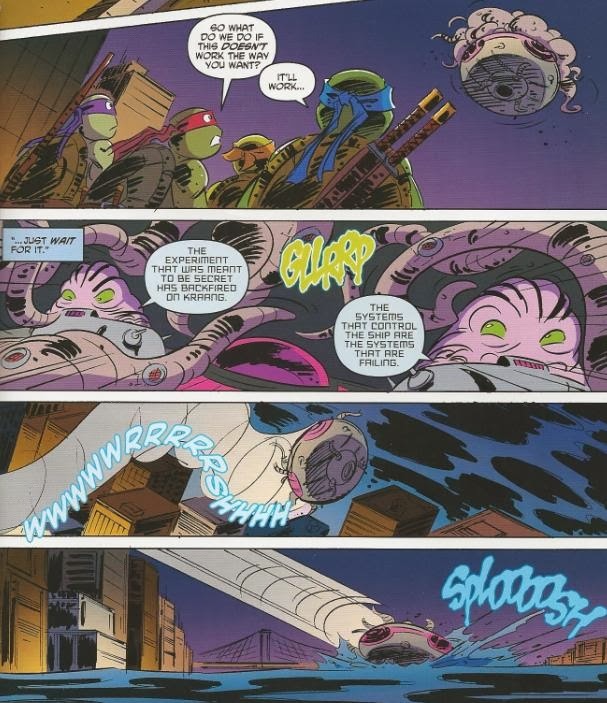 The Turtles use the words of wisdom Splinter delivers at the start of the story to defeat the villain at the end, the Kraang receive a taste of just desserts and there’s a droll comedy relief gag to wrap things up in the final panel. It isn’t exactly innovative stuff, no, but the storytelling is pretty on par with what we’ve been seeing so far and it’s a solid one-shot story with a rigid narrative structure. The threat of a possessed Shellraiser was an interesting conflict, though it only lasted for 8 pages. Actually, 8 pages is a pretty good chunk of space for a 22-page comic. I guess it’s just that the possessed Shellraiser didn’t really do anything too exciting in its role; it just drove around chasing the Turtles down the street, that’s all. But hey, when you’ve only got 22 pages to work with for a completely wrapped-up little tale, some restrictions are to be expected. I think the only thing Bunn seemed to falter on had to do with the oneliners and antics. Mikey is the repository for nearly all the comic relief in this issue and he becomes pretty insufferable by about the halfway point. I can’t tell if his jokes are sincerely bad or intentionally bad, but all his various asides and shenanigans just fall flat and I was getting pretty annoyed with him by the last stretch. I guess I didn’t pay enough attention to Splinter’s lesson on patience. All things considered, this was kind of an average issue that didn’t leave much of an impression on me. It’s got a good one-shot storytelling structure, if a bit formulaic, and Brizuela adds some life to the pages with his art. But the humor is bland despite Mikey trying way too hard to be funny. "kind of an average issue that didn’t leave much of an impression on me" pretty much describes everything I've ever read by Bunn, and why I dropped the Venom series shortly after he took over. It's not even that he's technically bad in any way; it just doesn't connect to me as a reader, and I forget about the book as soon as I put it down.